After a long day touring the Financial District (Bodies, WTC Memorial, Irish Hunger Memorial, Battery Park, and all sorts of fun things – I give a great informational/historical tour of the Downtown area! ), DLS and I walked up through Nolita to meet StB and C2 for dinner. Along the way, though, I suddenly noticed a sign and thought – holy we’re outside Dominique Ansel! so I insisted we go in and have a small bite. Because Dominique Ansel was the executive pastry chef when I went to Daniel and I dream about those madeleines… I dream about them. 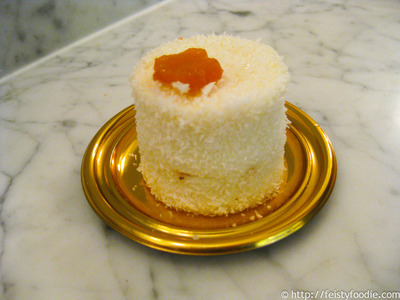 DLS looked through the case and lighted on this cake – mango & coconut. Obviously I didn’t try any as I’m allergic to coconut, but he really enjoyed it, noting how moist the cake was and how tasty. And then the cannele! 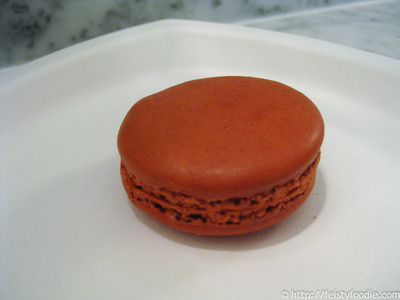 I’ve heard stories about this treat, and though I’d eaten one of these at Jean-Georges, this was the one to eat. Completely crunchy on the outside (I broke two plastic forks before I gave up and picked it up to bite into it!). The inside was wonderfully moist, soft, and slightly sweet, while the outside was hard and candy-like. I enjoyed it, though I don’t know that I’d always get this, especially… well, you’ll see. Yeah, DLS wanted some after I said that. 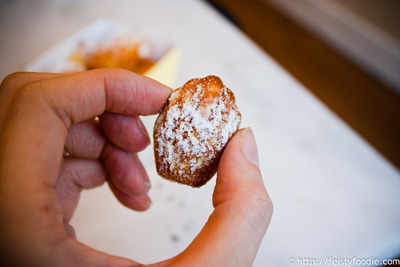 The madeleines were smaller than I remembered them at Daniel, but each cookie – with its slightly crisp , powdered sugar dusted exterior, a moist crumb on the inside, light lemon scent – brought me right back to my night at Daniel. Magical. I slowly savored each cookie and almost cried from being able to recreate the moment I knew madelines were my type of cookie. I sat there and had my Proustian moment, while TC probably thought I was crazy. DLS was able to try them hours later, after they’d cooled to the point of being regular cookies, but he also really liked them and thought they were very good. Of course, “If they’re this good cold, I wonder how they’d be fresh from the oven!” – yes, friends, I’m sure we’ll be back for more madeleines. Yvo says: While everything I tried was very good, I’m definitely going to return for the madelines and the madeleines alone. I am sure I’ll try other things as well, but something about those freshly baked mini cookies just did it for me. Reminders of a happier time, perhaps, or just some inexplicable tie to this cookie that brings a smile to my face. The cannele was interesting. I enjoyed it and didn’t break any forks with mine. lol. Next time, it will have to be a chocolate item. 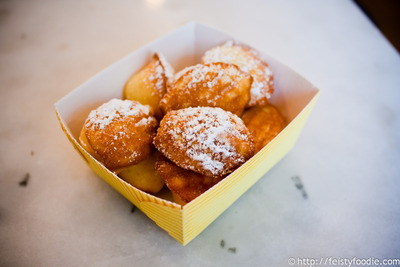 I have been DYING to go here after a similarly ethereal experience at Daniel and this little tip about when to get those precious madeleines damn near made my day! I will have to go, SOON! My current favorite place. 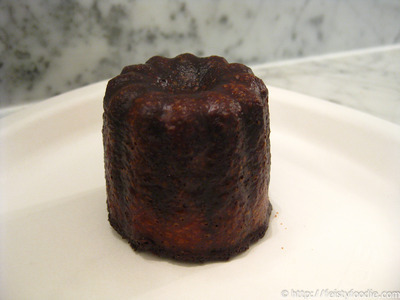 Best canneles ever. 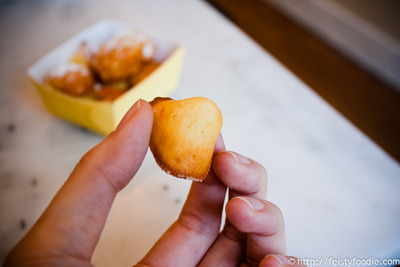 I have completely forgotten about those madeleines at Daniel until you wrote about your experience. What memories! I have to say, even re-reading this and not having been back for madeleines yet… it makes me smile. Just knowing I can have that again makes me happy!